Home / NBA / pointlessness / How long does a rebound take? A deep dive into the minutiae of NBA timekeeping. I'm working on a post on endgame strategies in the NBA that I hope to roll out soon. As part of that work, I needed to figure out approximately how much time runs off the clock between a missed shot and a rebound. Rather than keep this scintillating information to myself, or perhaps placing it behind a paywall and charging exorbitant sums, I am providing my findings here, free of charge. 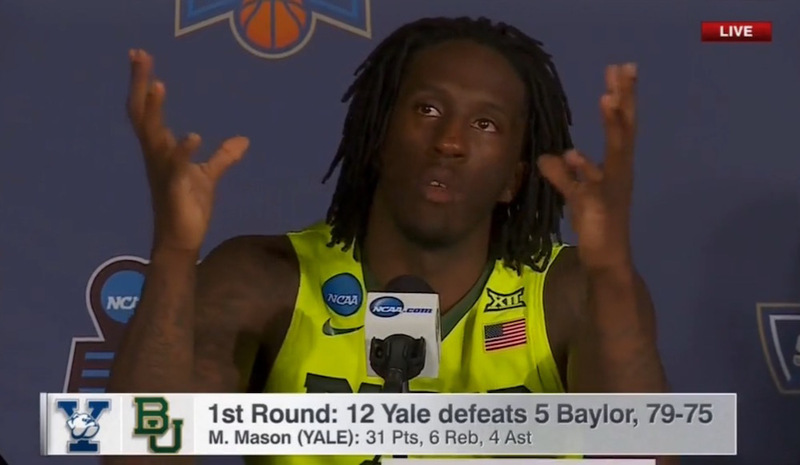 And for those of you unfamiliar with the concept of a rebound, and what it entails, I refer you to this excellent tutorial from Baylor's Taurean Prince. For two pointers, defensive rebounds are slightly quicker than offensive rebounds. For three pointers and free throws, it is just the opposite. The gap is particularly large for free throws. First, there was a sharp dip between the 2006-07 and 2007-08 seasons. This was largely driven by a decrease in two and three second rebounds. 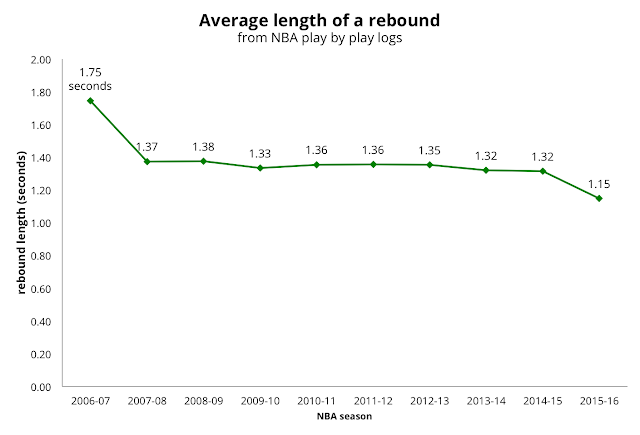 Two second rebounds went from 49% of total rebounds for 2006-07 to 28% the following year. Three second rebounds dropped from 11% to 5%. The difference showed up in more one second rebounds, increasing from 31% to 57% of the total. Of course, I'm not suggesting there was a sudden shift in how teams rebound the ball in 2007. The more likely explanation is that the NBA changed how its scorekeepers log timestamps for missed shots and rebounds. Perhaps new equipment was introduced, or there could have been a deliberate policy change mandated by the NBA. Or this could even be an artifact of how the play by play logs are post-processed into their final, official versions. 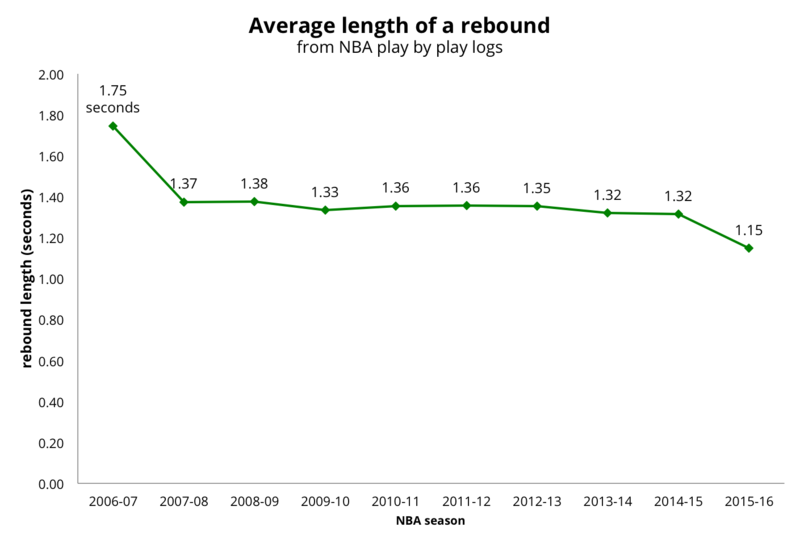 Average rebound length stayed fairly steady until the current 2015-16 season, when it dropped from 1.32 seconds to 1.15 seconds. In investigating the reason for this second drop, I noticed that rebound length is very venue specific. Some venues have long average rebound lengths, and that pattern holds over multiple seasons. For example, games played at the Philadelphia 76ers arena have had the highest average rebound length, holding consistent at about 1.7 seconds for the past ten seasons. Arco Arena, where the Kings play, has some of the quickest rebounds, averaging just 1 second over the past six seasons. The table below summarizes average rebound length for the 2014-15 season, 2015-16 season, and the year over year change. The 2015-16 drop seems driven by particular venues. The Utah Jazz have dropped a full 0.70 seconds from their average in a single season. Clearly, something was changed this season, but I have no idea what it could be, and could find no common pattern among the teams that showed the sharpest decline (I'm open to theories though). What's the significance? I don't know. Scorekeeper bias by venue, intentional or otherwise, is an established phenomenon, and this appears to be just another, more subtle example.